Climate change is expected to significantly reshape hydropower generation in California. However, the impact on the ability of hydropower to provide reserve capacity that can provide on-demand, back-up electricity generation to stabilize the grid in the case of a contingency has not been explored. This study examined the impact of climate change-driven hydrologic shifts on hydropower contributions to generation and ancillary services. 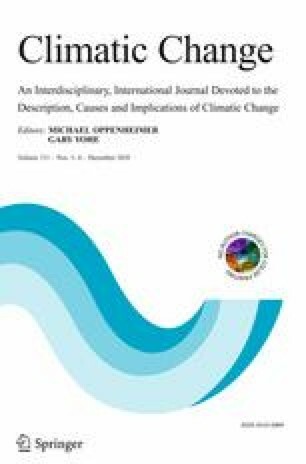 We used projections from four climate models under Representative Concentration Pathways (RCP) RCP4.5 and RCP8.5 to evaluate the impact of climate change conditions, comparing the future period 2046–2055 to the baseline 2000–2009, and observed a net increase of inflow into large hydropower units in northern California. However, as extreme events yield greater spillage, increased overall inflow did not necessarily yield increased generation. Additionally, higher winter generation and summer reservoir constraints resulted in decreases in the spinning reserve potential for both RCP scenarios. We also examined a regionally downscaled “long drought” scenario under RCP8.5 to assess the impact of an extended dry period on generation and spinning reserve bidding. The long drought scenario, developed as part of the California 4th Climate Assessment, involves rainfall congruent with 20-year historical dry spells in California under increased temperatures. In addition to decreased generation, the long drought scenario yielded a 41% reduction in spinning reserve bidding tied to a decline in reservoir levels. The decreased spinning reserve bidding from hydropower may require increased reliance on other electricity resources that can provide the same dynamic support to maintain grid stability under climate change. The online version of this article ( https://doi.org/10.1007/s10584-018-2329-5) contains supplementary material, which is available to authorized users. We acknowledge the World Climate Research Programme’s Working Group on Coupled Modelling, which is responsible for CMIP, and we thank the climate modeling groups (listed in Table S4) for producing and making their model output available. For CMIP, the U.S. Department of Energy’s Program for Climate Model Diagnosis and Intercomparison provided coordinating support and led development of software infrastructure in partnership with the Global Organization for Earth System Science Portals. The California Map used in this article was created using ArcGIS® software by Esri. ArcGIS® and ArcMap™ is the intellectual property of Esri and is used herein under license. Copyright © Esri. All rights reserved. For more information about Esri® software, please visit www.esri.com. The authors acknowledge the California Energy Commission for providing funding for this work under the Long-Term Climate Scenarios project, Agreement #: EPC-14-074.